Now Meet Satan - ZineWiki - the history and culture of zines, independent media and the small press. 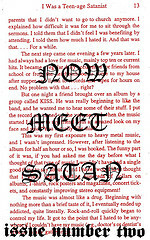 Now Meet Satan was a perzine published by Carol Steele of Seattle, WA. Now Meet Satan was published in the mid-'90s, there were three issues. Each issue Carol wrote personal stories, touring and show stories for her band Not My Son, interviewed bands and reviewed music. After the first issue, the publisher relocated to Austin, TX, where she continued publishing the final issues of the zine. This page was last modified on 17 February 2009, at 14:47.